Posted in Book Reviews, Once Upon A Week, YA Fiction - fantasy/sci-fi	by Cait H.
As the crown princess, Rose is never without a dance partner. She and her eleven sisters are treated to beautiful gowns, slippers, and dances at party after party in their father’s palace. But their evenings do not end when the guests return home. Instead, Rose and her sisters must travel deep into the earth to the wicked King Under Stone’s palace. There, the girls are cursed to dance each night, even when they grow exhausted or ill. Many princes have tried – and failed – to break the spell. But then Rose meets Galen, a young soldier-turned-gardener with an eye for adventure. Together they begin to unravel the mystery. To banish the curse, they’ll need an invisibility cloak, enchanted silver knitting needles, and, of course, true love. Princess of the Midnight Ball is a fantastic retelling of the fairy tale The Twelve Dancing Princesses. Cursed to dance at night for the King Under Stone, Rose and her sisters despair of ever breaking the curse. Soon their country is thrown into turmoil and cries of witchcraft when the plight of the princesses becomes known. Only Galen, a soldier recently returned home and working in the palace gardens, has the strength of will – and heart – to discover a way to save the twelve sisters from their fate. I adore Galen. He’s such a nice boy! He has known only war; being born to a career soldier and his wife, Galen has been on the front lines from an extremely young age. An orphan, he travels to the capitol city in order to find the rest of his mother’s family. Once there, he takes a position helping his uncle in the palace gardens. Galen is extremely polite, loyal and hard working. He respects his aunt and uncle, and doesn’t disregard the youngest princesses just because of their age. He always tries to cheer them up and keep them (all) safe. The twelve princesses are named after flowers. It’s a little confusing keeping them straight all the time (besides the oldest and the youngest ones), but Rose is the main princess to know. Rose is the oldest, and deeply cares for her siblings. She’s very refined and poised, and has a protective streak a mile wide. She would do anything to keep her sisters safe (and she does). Rose can keep her head in a tough situation and has strength to spare. The flow of the action and storyline was done very well. I was never bored, but neither was I overwhelmed with information and activity. The mysteries of the plot begin to build right away with the Queen visiting the King Under Stone and when Galen meets a strange woman on the side of the road. Add in the fact that the princesses are cursed to never speak of their plight to anyone. The reader receives more information than the characters, so it’s not quite a mystery. Instead you find yourself wishing that Galen could hear you and just see what’s in front of his face (obvious details to us, but not to him). The idea isn’t so much to find out what’s wrong with the princesses, but how Galen is going to save them from dancing every night. Right up until the end you can’t be sure if he will succeed or not, and the last few action scenes are wicked. Even though it’s based on a fairy tale, Princess of the Midnight Ball is set in a time period that seems to be a mash-up of a real time and place. The countries resemble Germany, Belgium, Rome etc., and it is close to the start of the inquisition – the witch hunts that swept through Europe. The story had that traditional fairy tale feel to it, but the setting made it just a little bit more familiar. Princess of the Midnight Ball is a masterful adventure full of magic, love and chivalry, proving that even the worst events can lead to happy endings. it is illegal to be young. Children are all but extinct. Longevity drugs are a fountain of youth. Sign the Declaration, agree not to have children and you too can live forever. Refuse, and you will live as an outcast. For the children born outside the law, it only gets worse – Surplus status. Not everyone thinks Longevity is a good thing, but you better be clear what side you’re on. . . . Surplus Anna is about to find out what happens when you can’t decide if you should cheat the law or cheat death. I think I first heard about The Declaration from Ana and Thea of The Book Smugglers, and I’m glad I did! It was a perfect choice to read for the dystopian challenges I’m taking part in right now. Anna, our protagonist, is a Surplus teen living in Grange Hall – a home for Surpluses where they are taught to be Valuable Assets. Anna is a Surplus because her parents did not Opt Out of Longevity (a drug that lets you live forever), yet had a child anyway – which the Declaration says that one must not do. Because everyone is living forever, the world was becoming too populated. Governments made the decision that if you choose to take Longevity and live, you cannot have children and put more strain on the world’s resources. And so Anna is a Surplus. A perfect Surplus, in fact. She has been fully indoctrinated into the lies she is fed at Grange Hall, and never questions her lot in life – to become a Valuable Asset and pay back her debt to society. Until Peter arrives. The oldest Surplus to be caught and sent to Grange Hall since Anna has been there, Peter has Anna questioning everything she has been taught about her parents, the Declaration, Longevity and the difference between being Legal and Surplus. The Declaration is a fairly slow book, but not boring. 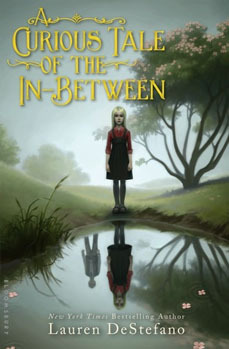 It’s the first book in a duology (the second book is The Resistance: the trade paperback is due out January 26, 2010, the hardcover is already available), and I found that it consisted of mostly world building and character introduction. We learn about Longevity and some basics of how society works in the year 2140, we get backstories on our characters and current information/thought/feelings. The main action and suspense in the novel comes from Anna’s indecision about Peter and everything he tells her. We are left constantly wondering what she will do; will she stay? Go with Peter? Fight against being a Surplus? Become a Valuable Asset? Our antagonist, Mrs. Pincent, is the definiton of a cruel woman – at the beginning. I don’t want to give spoilers, but Mrs. Pincent’s character was one of the only problems I had with the book. She became a cliché. One of those characters who you hate, but then find out there are reasons for them being the way they are, and suddenly you don’t know if you should keep hating them, or pity them. The other problem I had was that I thought Anna was not quite as brainwashed as she should have been. She’s lived at Grange Hall since about the age of 2 or 3, with no contact to the outside world, and the Declaration and other rules and regulations pounded into her brain. I expected her to be a little more firm in her understandings in beliefs. But hey, if those are my only complaints, I think the book did great! I was fine with the slow pace, since it was sufficiently interesting and the second book sounds like it should have some good action in it. This book is also part of the dystopYA challenges hosted by Bart’s Bookshelf and Books on the Nightstand. Posted in Banned Books Week, Book Reviews, YA Fiction - fantasy/sci-fi	by Cait H.
When a letter arrives for an unhappy but ordinary Harry Potter, a decade-old secret is revealed to him. His parents were wizards, killed by a Dark Lord’s curse when Harry was just a baby, and which he somehow survived. Escaping from his unbearable Muggle guardians to Hogwarts, a wizarding school brimming with ghosts and enchantments, Harry stumbles into a sinister adventure when he finds a three-headed dog guarding a room on the third floor. Then he hears of a missing stone with astonishing powers which could be valuable, dangerous, or both. So begins Harry’s years at Hogwarts, which are filled with more adventure, near-death experiences, magical mishaps and crazed Dark Lords than any one boy really needs. Harry Potter has made the Top 10 Challenged Books in 2001 (#1), 2002 (#1), and 2003 (#2). The series has also been on the list in 2005-2006 (Half-Blood Prince), 2006-2007 (Philosopher’s Stone, Chamber of Secrets, Prisoner of Azkaban and Half-Blood Prince) and 2007-2008 (Philosopher’s Stone, Chamber of Secrets, Prisoner of Azkaban, Goblet of Fire and Half-Blood Prince. J. K. Rowling has been on the Most Frequently Challenged Authors of the 21st Century in 2001, 2002, and 2003. Harry Potter came in at number 48 on the 100 Most Frequently Challenged Books: 1990-1999. Most common reasons that were noted in suggestions for banning were: anti-family, occult/Satanism, religious viewpoint, violence, and promotes witchcraft. I’m going to admit right up front that I may be slightly biased when it comes to this review. Why? Because I absolutely love this series and thus have blinders on when it comes to anything that might warrent a slight negative notation in a review. I fully believe that Harry Potter was my introduction into the amazing world of fantasy and started off a four year addiction to reading fantasy and only fantasy. I was thirteen when this addiction started. I actually read the second book before I had even read the first – the first was unavailable in the bookstore at the time. I read it, loved it, and proceeded to borrow the first from a friend. I recieved the third book for my thirteenth birthday in March 2000 – not even a full year after it was published. I spent my high school years waiting for the next Harry Potter (book four, than five and six), always waiting – it only took me a few hours to read them, after all. Book seven, the final one, was released on July 21st, 2007. I was going into my third year of University and I went to the midnight release. I find it hard to discribe exactly what it is that drew me into the series; if a friend hadn’t had the first book I probably wouldn’t have even heard of the series until it became so popular. I don’t remember what I liked so much about the books that I fell in love with them, I can only say what I love about them now, almost ten years after I started reading them: Harry and his world. The character of Harry Potter is one that I see in intense clarity in my mind (and no, he doesn’t look like Dan Radcliff). I find the world Rowling created to be incredibly rich in detail. I believe what helps the series appeal to so many kids is the idea of a secret world where everyone does magic and they live in a boarding school away from their parents in order to learn said magic. I don’t know about you, but I’ve always wanted to go to boarding school (summer camp was as close as I ever got to living away from home as a kid/teen). And to learn magic at the same time?? Bonus! Her characters are many and vary in personalities and likeability. Each one has his/her own quirks that either make you love them, like them, or hate them. Rowling’s writing style invites you in to the world she has created and asks you to stay. To become involved and invested and want to know more, to see how it all ends. No, her writing is not immaculately wonderful, she uses too many adjectives sometimes and occasionally spells things out for us when she doesn’t need to, but it’s engaging. You’ve seen me mention my penchant for crying, yes? The last couple chapters of book six had me bawling into a kleenex – I could barely see the pages to finish reading. In book seven I starting crying at chapter twenty-four and it continued off and on (mostly on, near the end) until the book finished. That means from pages 387-600, I was in my room reading, crying and without kleenex (the corners of pilow cases work well). I was invested in the characters of this series and when they hurt, when the died? I cried. I didn’t want them to die! I love these characters (and even if I don’t love them, I’m still invested in them). The Harry Potter books feel like stepping into a second home whenever I open them. Did I ever once get the impression that these books were telling me to go practice the occult and Satanism? No. Did they ever make me want to practice witchcraft? Well, ok, yes – but I never went around trying to jinx or hex people or make potions – I knew better. Did I think they were violent? Mmm, yes, but not more so than any episode of Power Rangers, Family Guy, pro-wrestling or UFC. In actuality, there was probably less physical violence than in most books – it was mostly done by spells. Did I get a vibe of anti-family? Not at all! Harry wants nothing more than to have a family. The Weasley family is one of the most tight-knit families I’ve read about in ages. They accept Harry and Hermione into their home with barely a twitch. Even the Dursley’s, for all the abuse (and keeping a child in a cupboard, making them cook/clean/weed/wash cars/etc. and withholding food is definitely abuse) they heaped on Harry, doted on their biological son. As for religious viewpoint? I really think this one only comes in to play for the people who think the books promote Satanism/occult/witchcraft. The books don’t mention religion at all, really. Harry Potter is my comfort series. I don’t believe anyone should avoid it just because of all the hype surrounding it, or because they didn’t like the movies, or whatever. You won’t know if you like it until you actually read it. Oh, and those blinders I mentioned before? I do have complaints, but if I started talking about the series in depth, you’d all be here forever!